Whether you're performing on stage or tracking vocals in the studio, Auto-Tune Live brings you genuine Auto-Tune technology optimised for real-time pitch correction and effects, including Formant Correction, natural and artificial Vibrato Controls, and our unique Throat Modeling technology. Whether you're performing on stage or tracking vocals in the studio, Auto-Tune Live brings you genuine Auto-Tune technology optimized for real-time pitch correction and effects, including Formant Correction, natural and artificial Vibrato Controls, and our unique Throat Modeling technology. 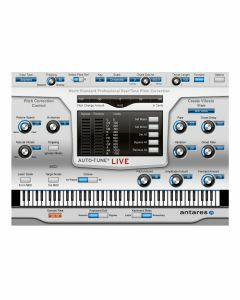 And with Auto-Tune Live's MIDI capabilities, you can choose your target pitches, and control all of Auto-Tune Live's key performance parameters in real time with your MIDI controller. Pro Tools 8.x to 10.x. Pro Tools 8.x â€“ 10.x.